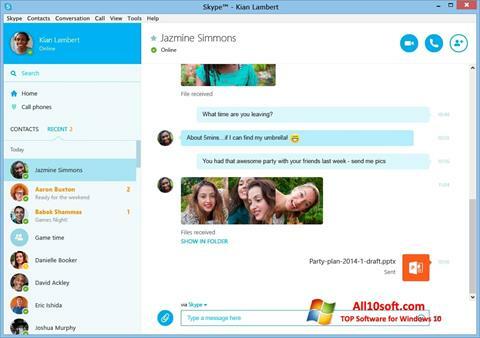 Skype for Windows 10 - instant messenger with a conference call. The application uses its own video and audio streaming protocol, allows you to share files, send pictures of your desktop, supports stickers, can automatically adjust the quality of communication depending on the connection speed. The program interacts with a list of contacts, can group records with Facebook data, has the function of testing the quality of communication and built-in store extensions. The conference call in the messenger supports up to 25 simultaneous connections during an audio conversation and up to 10 participants during a video call. You can free download Skype official latest version for Windows 10 in English.